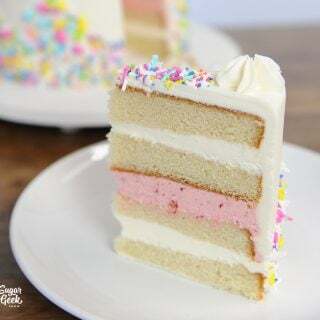 I have had MANY requests for a moist, delicious vanilla sculpted cake recipe that uses AP flour instead of cake flour. Now you know I am #teamcakeflour all the way but I understand not everyone has access to cake flour or just wants a cake that’s a little bit better for carving. This cake does the job and is my go-to cake to switch up the flavors to make it custom or to use in sculpted cakes. This is also the recipe to try if you’re looking to dip your feet into the baking pond. It’s practically fool-proof, delicious and a great cake to serve up for a birthday party. For a while now I have been developing a series of cake recipes that work well for sculpting because even though in the past I have just used my regular cake flour recipes because I LOVE the taste the best, it can be challenging to teach that to other people. Especially if you’re not used to handling a delicate cake flour cake. Since my job is to teach people, I thought coming up with a vanilla sculpted cake recipe that still tastes amazing but works really well for carving and sculpting would be my go to. This cake is based on the vanilla cake recipe by Yolanda Gampp. I used her recipe for years when I needed something sturdy but have since made some adjustments to make the recipe more to my own tastes. A little less sugar and some added fat to keep the cake moist since I don’t like using simple syrup on my cakes. I also have a red velvet sculpted cake recipe, a chocolate sculpted cake recipe and a bright red sculpted cake recipe that can be adjust to any color really. You might be wondering if this recipe is good for stacked cakes. Yes it is! 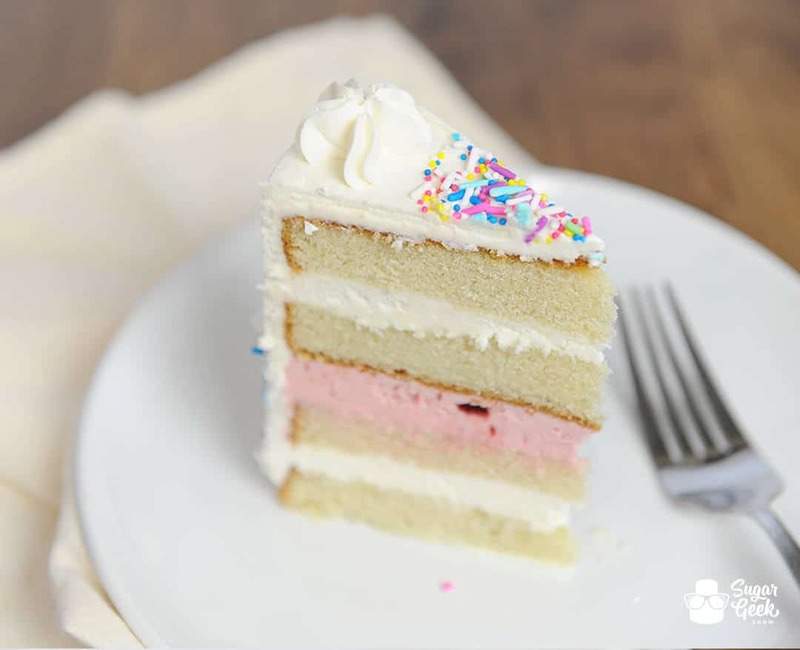 Some places you can’t find cake flour very easily or maybe you just prefer the durability and flavor of AP flour over cake flour. Whatever the reason, it’s nice to have options. 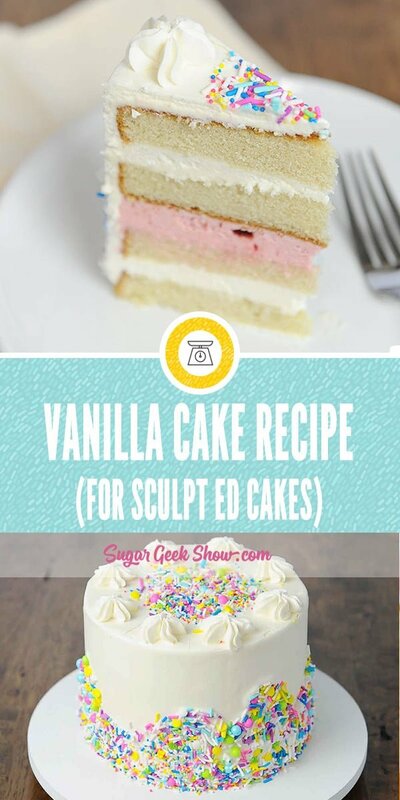 This vanilla sculpted cake recipe doubles as a great vanilla stacked cake recipe. 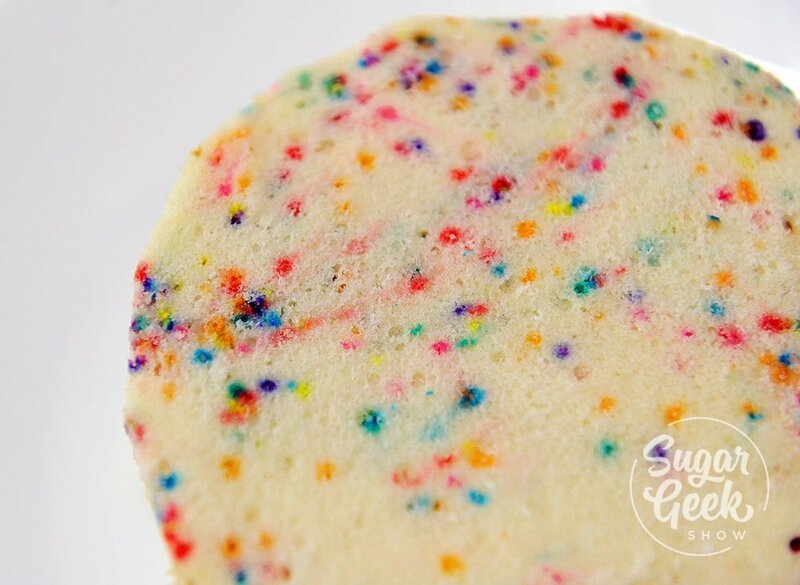 If you want to make it into funfetti, you can stir in a couple of Tablespoons of rainbow sprinkles right at the end before you put the batter in the cake pan. Then sprinkle a few more on top because they tend to sink as the cake bakes. 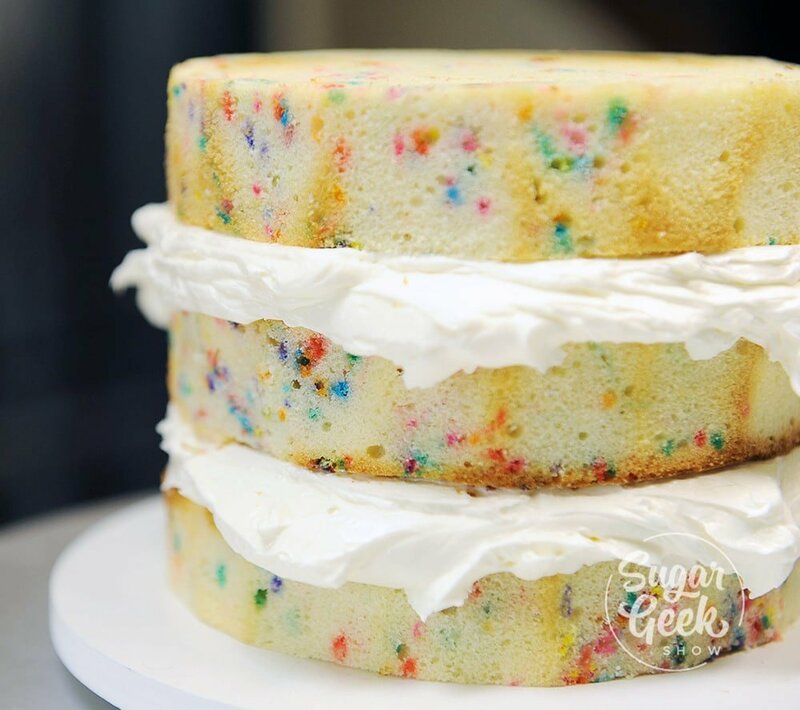 This way you’ll have sprinkles all through the batter. When I’m stacking my vanilla cakes, I like to trim off the outside layer of crust so that I get some nice clean slices. In vanilla cake especially I feel like the brown on the outside takes away from the pretty white texture on the inside of the cake. Sometimes you need a nice sturdy cake and the taste isn’t important. These types of cake are usually used for display cakes that are going to be left out for a long time or for competition cakes. 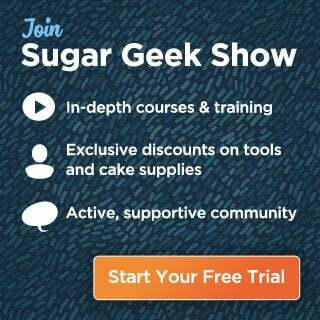 Yes there are things called cake shows where cake decorators come from all over the world and compete against each other. Most of the time you have to use real cake. For these cakes I like to use box mix. I know that sounds counter-intuitive because I always say to stay away from box mix if you want a nice stable cake. The reason why box cake is so great is because it has preservatives in it. These preservatives protect the cake from getting mold or going bad. I know it sounds terrifying but I actually had a display cake made with box cake sitting on top of my fridge for over a year and it never got moldy. It’s like those McDonalds french fries you find under your chair. They just dry out and become perfectly preserved. Freaky. To make my boxed vanilla cake sturdier, I add in two cups of flour, 4 extra eggs and leave out the oil. I also tend to over-mix the batter so it get’s really tough. It may not look the best but it’s great for holding it’s shape for a competition. This sturdy cake is also better for when the cake has to travel a long way by car or even plane and not refrigerated for long periods of time. This is the BEST vanilla sculpted cake recipe using AP flour that I have ever tried. It's moist, tender crumb is great for using in wedding cakes or sculpted cakes and the flavor can easily be adapted to make custom flavors! Preheat oven to 350F and prepare two 8" rounds with cake goop or preferred pan spray. Bring back to low mixing, add in eggs one at a time. Let mix in fully for one minute fore adding the next egg. Mixture should look smooth, not broken or lumpy. If it is, your eggs might have been too cold. Bake for 25-30 minutes or until toothpick comes out clean. Do not over-bake or your cake will shrink and your sides will not be straight. Hey Liz! This is the vanilla cake recipe I use. It normally comes out great, however, I just had a cake tasting where a person told me the cake was very dry (my heart broke a little bit). I tried it after they left and it was indeed dry. I never had this problem before with this recipe. I may have done something wrong or overbaked it this time. Do you know if I could add a certain amount of vegetable oil (like 1 oz) or something else as a backup for moisture? Or would that compromise the structure and flavor of the cake? I’d love to hear your thoughts! Thanks much. Hey Liz Just wondering what you use to grease your tins. I remember an Instagram live you mentioned a mix of butter and flour ( memory is shoddy though). Thanks a bunch! Does this recipe do well for cupcakes? I usually doctor up cake mix but I really want to change to scratch mix. I want to try this but can batter sit out while other cakes are baking or do you have to use it right away? The oil is in your list of ingredients but not in the written instructions. First time making a carved birthday cake. I plan to use this recipe but wanted to know if I can substitute the vanilla for another flavor extract (like orange or lemon)? If I do add a fruit extract do I still put in the vanilla? I understand Marcus but most recipe templates used on websites are not setup to accommodate various pan sizes so the only thing I can set it to is cups. Typically 6 cups will make Three 6″ cakes or two 8″ cakes (2″ tall) but you will have to adjust the recipe yourself up or down according to how many cups you think you will need for the size of the pan you are making. When I adjust your recipe to fit a 9×13 cake pan (which says is 15 cups), your recipe goes up to 11 eggs and 7 cups of flour. That just seems way to high to me. What am I doing wrong? If you convert oz to grams with an online calculator that should give you what you need or you can use a scale that has oz or grams (mine does) don’t worry about millimeters. It’s all by weight. Hi can we mix strawberry flavour paste in this recipe? Will it affect the outcome. You can definitely add a couple tablespoons but no more. Hi, Is it ok to use a hand mixture instead of a standing mixture? Hi! Planning to use this recipe on a carved Lightning McQueen cake for son. We want to make it chocolate flavoured so can i just replace some of the flour for cocoa powder, if so how much would you say? 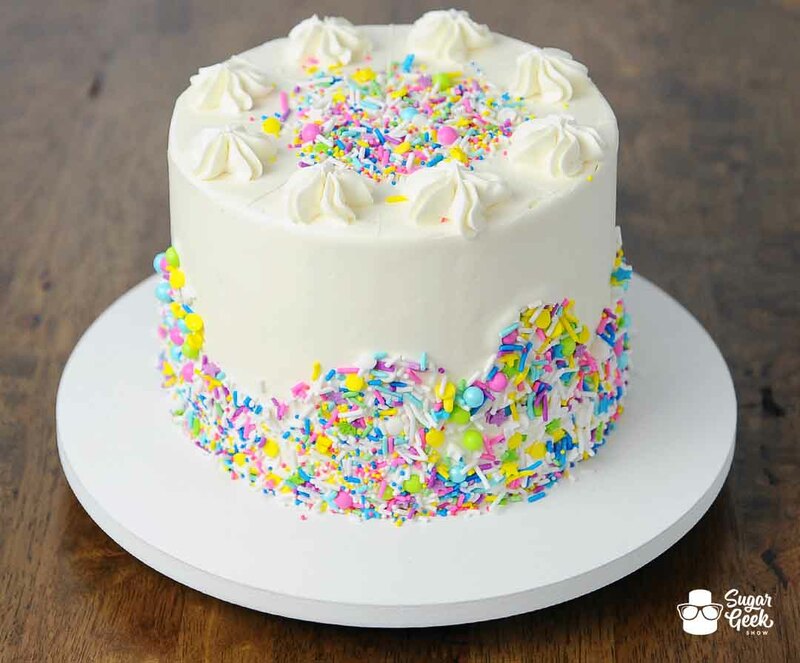 Can you put fondant on this kind of cake, or must it be frosting? As this is my first time, any important tips welcome!! Thank you. Sorry cakes don’t work that way. Please check out the chocolate cake recipe for a nice chocolate cake that will be perfect for what you need to do. Yes you can put fondant on it. can I use cake flour instead of AP flour in this recipe? Hello I love this recipe so much. The flavor is AMAZING!!!! I had One issue tho…after taking my beautiful cake out of the oven it shrank down is that normal? What about baking times for 9 inch pans? Start with 30 minutes then check to see if you need more time. Could have been under-mixed, It’s hard to say without knowing how you made it. Could I use this exact recipe (same amount in measurements) for a 9×13 pan? I want to try and cut it and reshape it into a 4 for my son’s 4th bday. Thanks!